French’s (French’s Welding & Maintenance Service, LLC and French’s Marine Services, LLC) is among Louisiana’s most respected and cost-effective sources for small to medium pipe and structural fabrication, inland facilities construction, shallow water pipeline installation, and field maintenance services. How We Work: French's philosophy: "focus on our customers with quality work, on-time delivery, effective communication, quick response, and safety." … a formula that equates to PROVEN PERFORMANCE and PROVEN VALUE. People: French’s workforce is a team of seasoned professionals having years of experience in the industry. Adherence to strict safety standards and a code of environmental responsibility, along with a commitment to quality and on-time delivery have earned French’s an enviable track record on projects throughout the Gulf Coast. All welders are certified under ASME B-31.3 for process piping, and all employees receive HAZWOPER, H2S, and water survival training as part of an ongoing formal safety education program. French's personnel are experienced in fabrication, maintenance, construction, installation, demolition and abandonment projects. Location: Strategically based in Venice, Louisiana, our fabrication yard and bulkheaded dock space accommodates large barges and workboats and adjoins a well-equipped shop with up to a 100-ton lifting capacity and covered fabrication area. Turnkey fabrication and in-house design make French's a one-stop shop for specialty projects for major oil producers and independents alike. Equipment: French's rental fleet consists of Workboats, Jo-Boats, Self-Propelled Work Barges, and Crane Barges to 100 ton. 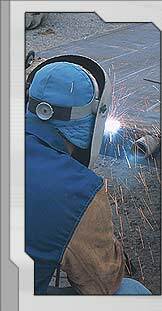 All content and images copyright © 2003-2011, French's Welding, Inc.